ICC World Cup 2015: What is the 'Par Score'? When Pakistan completed its innings against Zimbabwe on Sunday, the popular opinion was that 235 was not enough. Social media was abuzz with predictions of Zimbabwe's triumph and how many overs they would take to complete the task. However, what transpired was expected by very few. It was a tremendous effort by Pakistan's bowlers, despite sloppy their fielding, to overcome the odds and defend a sub-par total against a team which had scores of 277, 286 and 289 which chasing against South Africa, UAE and the West Indies, respectively. But was 235 really a sub-par total? Everyone from commentators to TV experts and fans have been stating that the par total in this World Cup is 300. I don't think that is true. I think 300 is a winning total, not a par one; more often than not teams scoring 300 will defend it successfully. I did some digging to figure out whether this hypothesis is true or not, and the results are quite interesting. 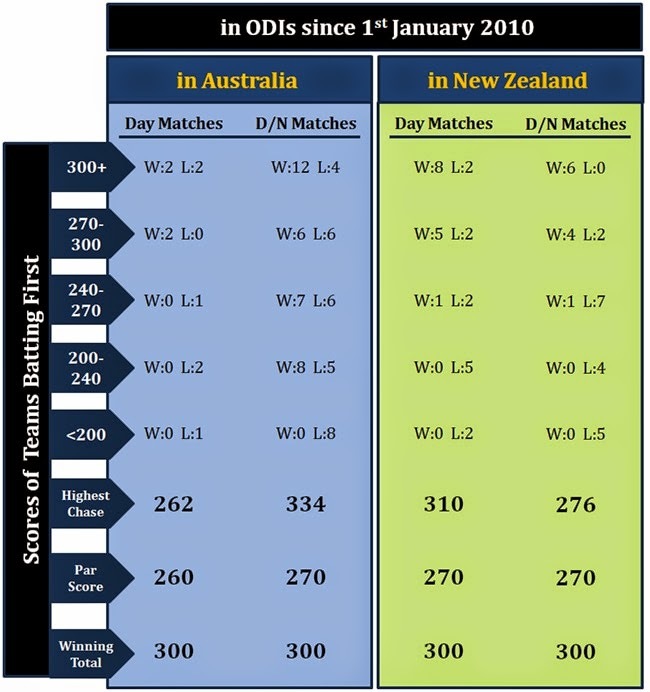 The analysis considers ODIs played in Australia and New Zealand in past 5 years, starting from 1st January 2010, and breaks down the results for day matches and day/night matches. In all ODI games played in Australia in the past five years, the team batting first has won 37 times, while the team fielding first has won 33 times. Out of those 37 wins, a team scored 300 or more 14 times and won the match. There are only four instances of a team successfully chasing 300 or more, with the most recent one being Australia's chase of 304 against England in January 2010. Australia has managed three out of those four successful chases of above 300, with the other one managed by India against Sri Lanka in February 2012. Those four chases came in Hobart, Sydney, and Brisbane. A total of 300 or more has never been chased in Melbourne, Perth, Adelaide, or Canberra in the past five years. Every time a team has scored 300 in any of those grounds, they have won. Out of those 37 wins by teams batting first, a total between 200 and 300 was defended successfully as many as 23 times; that is a success rate of over 60 per cent. Additionally, almost 60 per cent of the wins by teams chasing targets (19 out of 33), was when the target was below 270. It is interesting to note that all of the four successful run chases of 300 or more were in day/night games. A total of 300 or more has never been chased in a day game in Australia in the past five years. In fact the highest successful run chase in a day game in Australia is 262. Therefore, I do not think that 300 is a par score in Australia. It is a winning score. A par score is more around 260 to 270. A total of 270 or more has been defended successfully 22 times, and chased successfully 10 times. In New Zealand, the numbers tell a different story. In all ODIs since January 1, 2010, teams batting first have won 26 matches, while the team fielding first have won 31 matches. In day games, the results are more even with 14 wins for teams batting first and 13 wins for teams fielding first. However, in day/night matches, it is interesting to note that teams fielding first have won more games (18) than teams batting first (12). In every single one of the 26 matches that the teams won while batting first, they posted a total of above 240. In all but two matches, the total was above 265, while in 14 matches a team scored 300 or more and won. That is a success rate of more than 50 per cent for teams scoring 300 or more. A total of 300 or more has been chased successfully only twice in New Zealand in the past five years, with both instances witnessed during this World Cup - Ireland's win against West Indies and Sri Lanka's win against England. In fact, the three highest successful run chases in New Zealand in the past five years have taken place during this World Cup - the above mentioned matches and Zimbabwe's win against the UAE. Two of those successful run chases took place in Nelson, while one was in Wellington. Such totals have not been chased successfully in Dunedin, Auckland, or Christchurch. It is also imperative to point out that these three run chases of 310, 305, and 286 by Sri Lanka, Ireland, and Zimbabwe respectively came in day games. Of the 13 successful run chases in day games in New Zealand, only six have been of scores of 240 or more. Out of the 18 successful run chases in day/night matches in New Zealand, nine were of targets in excess of 240, but all were well below 300. A total of 300 or more has never been chased in New Zealand in a day/night match in the past five years. The highest-ever successful run chase in a day/night match in New Zealand is 276, which was also the highest successful run chase in New Zealand prior to this World Cup, achieved by the Kiwis against Australia in March 2010. A total of above 240 has been chased successfully only 15 times in New Zealand with nine of them of scores between 240 and 270. A score of 240 and above has been defended successfully as many as 26 times. That is a significant difference; teams batting first and scoring 240 or more win 63 per cent of the matches in New Zealand. 240 is definitely a good score in New Zealand, while 270 can be considered a par one. 300 is undoubtedly a winning total in New Zealand, especially in day/night games. Coming back to Pakistan, taking note of these numbers is important for their next two matches against the UAE and South Africa. Both the matches will be played in New Zealand and both will be day/night games. One must remember that the highest successful run chase in a day/night game in New Zealand in the past five years is 276. The par score in a day/night game in New Zealand is around 270. If Pakistan can bat first and post a total in the range of 260 to 280, its chances of winning will be very high. Even if they are up against AB De Villiers. If Pakistan end up bowling first against South Africa then they need to somehow restrict the Proteas to below 240, otherwise their chances will diminish.